Who are you? How do you want your boutique to express you and connect with your customers? What’s your why? Opening up a boutique involves a lot of questions. Finding answers to those questions involves research and soul searching. Many of those answers need to be found before you open your doors, yet some answers will only come after some experience. Q: Are you crazy for even thinking of opening a retail business? Q: Will my business be okay if I don’t have a high-intensity salesperson on my showroom floor? A: Yes, of course it will. “A store’s success, I feel, is based on having a quality product, reasonable prices, and great customer service,” said Zak Peterson, co-owner of Happy Sleeper Mattress & Furniture Stores in Waite Park, Minnesota. “Being pushy and overbearing are definitely not qualities we have. We like a laid back and easygoing atmosphere.” It’s all about the vibe you want to have your customers experience. A: Okay, so we don’t have a good answer for that, since we might not have met you yet. 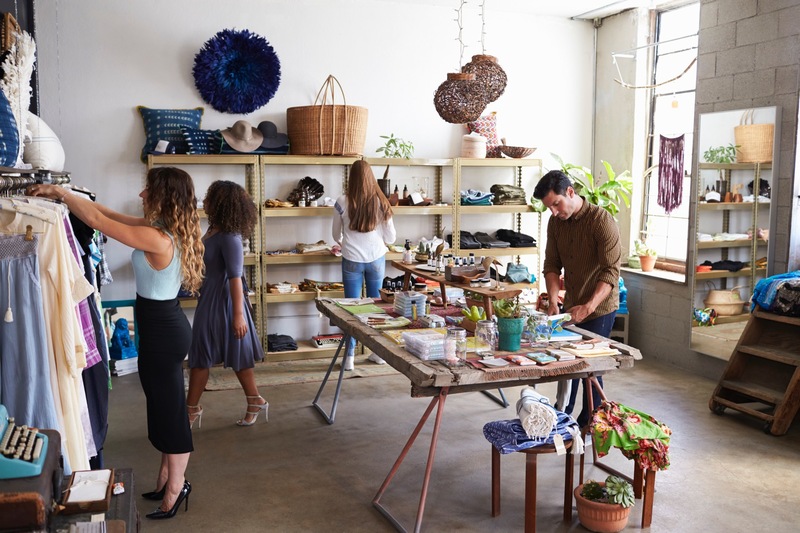 Communicating who you are through your boutique establishes your style and where your store fits in the local marketplace. For example, PayGo Headquarters is located in Rochester, Minnesota — my hometown. If I want to buy playful, whimsical gifts I shop at Tangerine’s. When I need an outfit that is the right mix of staple and trendy, Mainstream Boutique is my go-to. And, when I want to add some decor for my home, or to buy a local artisan’s work, Dwell Local has what I want. Each store does reflect its owner’s personality and interests. If you’re going to take the time to open up a store, that store should be a space that you’re excited to be in, that welcomes customers who get you and love how you’ve curated the place. Q: Where should you open up shop? A: In The Martha Rules: 10 Essentials for Achieving Success as You Start, Build, or Manage a Business, Martha Stewart shares this insightful story: Manhattan is a huge market for paint, but interestingly, Sherwin-Williams executives have explained to me why they do not have many stores in the city. Paint cans are heavy and unwieldly to carry, so unless you can provide parking right next to your establishment, it is sheer folly to open a paint store. Take some time to think about how your location could impact your ideal customer. Q: Once you have customers, how will you keep them? Q: How will I find the time to do everything a person needs to do to run a successful boutique? A: Automate, delegate, and learn from those succeeding in the marketplace now. Great software, like PayGo’s Point of Sale solution can help you manage everything from customers to inventory to marketing. Taking a little bit of time to set up processes can save many dollars and hours down the road. The old adage, “A stitch in time saves 9,” is true. Hire employees and select vendors with care. Seek out trade organizations and mentors who can help you fill your cup with what you need to continue building your boutique dream. Q: Are there more questions you’ll need to answer? A: Yes. This blog post is just a starting point. Thankfully, there are several free resources online. You may want to look at one of the many business planning templates available for free online. One of my favorites is Business Boutique’s. If you want to know how point of sale software can help you begin your business on the right foot (and save those stitches in time), connect with us. Send an email to consultant@paygopos.com. We love to hear from you.